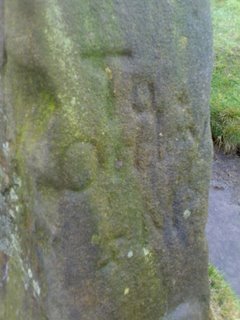 The Milestone Society (no, I didn't make them up) to see if they have record of this milestone which ClickDad and I stumbled across on Beamsley Beacon near Ilkley, Wharfedale. Located at approx 53 deg 57'23" N, 1 deg 50'09" W this milestone shows the way to Skipton, Knaresborough and Ottley. I've shown a photo of the side with the peculiar spelling of where is now called Otley. I'm also surprised that Knaresborough is only 11 miles. Will check that too.